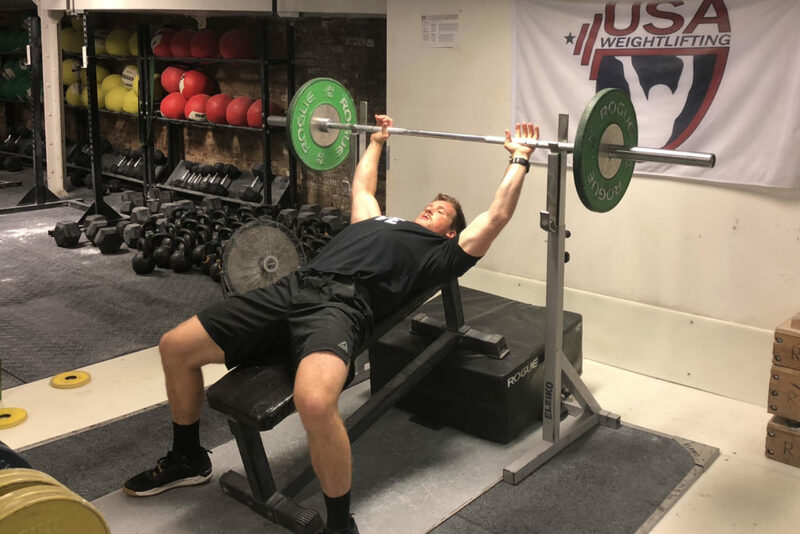 The bench press (and all of its variations) are widely used across strength and fitness programs to build upper body strength, muscle mass, and aid in sports performance. 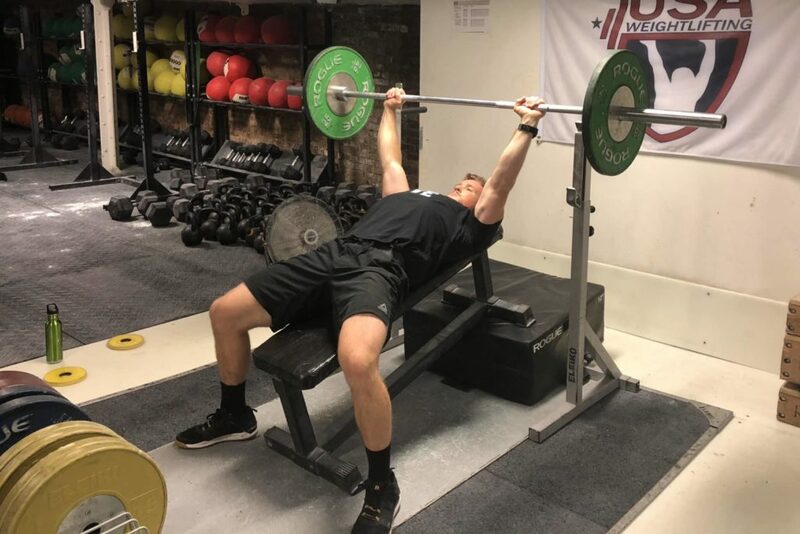 Incline bench pressing is a movement that can be used to develop the upper pectoral muscles (chest), increase shoulder strength, and add more muscle mass to the upper body for sports like powerlifting, strongman, and even Olympic weightlifting. The below step-by step form and technique guide is for the incline bench press, using a barbell. Note, that most of the steps are similar if you were to use dumbbells or a specialty bar, however some slight technique adjustments may occur. Step 1: Set a bench so that the incline is roughly 15-30 degrees vertical within a power rack. The higher the incline of the bench, the greater dependency on the shoulders. Below is a makeshift incline bench press set up that can be used in gyms that may not have adjustable benches or in home gyms. Step 2: Set the hips and upper back on the bench, with the feet strongly rooted into the floor. This bench press set up position will help lifters brace harder and stabilize loads. Step 3: Grip width can vary, however generally speaking the hands should be slightly wider than shoulder-width. A good rule of thumb is that at the bottom of the bench press, the forearms should be perpendicular to the ground. Too wide or too narrow of a grip width will result in the forearms angling outwards/inwards. Step 4: Unrack the barbell so that the bar is stabilized above the upper chest/shoulders. To stabilize this position, forcefully retract the shoulder blades and squeeze the barbell. Step 5: Pull the barbell to the chest, being sure to actively use the back muscles to keep the chest and shoulders from rounding forwards. As the bar is lowered, the lifter should actively stretch the pectoral muscles, making sure to keep the shoulder back on the bench. Step 6: While keeping the elbows pulling inwards towards the body, press the bar upwards and extend the elbows. Be sure to not lose control or stability in this phase. Generally speaking, the elbows should not flare out and the shoulders should stay back on the bench. Step 7: Reset and repeat for repetitions. Be sure to read below on how to program this exercise (sets, reps, and weight) for strength, hypertrophy, and muscle endurance. The below muscle groups are targeted while performing the incline bench press. The chest muscles are worked during most bench pressing movements, however the incline press does place higher demands on the upper chest muscles due to the increased angle of the body in the press (more vertical, typically 15-30 degrees from horizontal). Like the bench press, the anterior deltoid (shoulder) is active in the incline bench press, however to an even greater extent. As the lifter assumes a more vertical pressing plane, they will start to target the upper chest and the anterior deltoids. If they were to press in a completely vertical overhead fashion, most of the movement would target the deltoids as a whole (shoulders). The triceps work to forcefully to extend the elbow in the press. By performing an incline bench press, the triceps are worked in a similar way as the flat bench press. Lifters and coaches can diversify triceps pressing strength by adding in this exercise to challenge different pressing ranges of motion and aid in lock out strength. 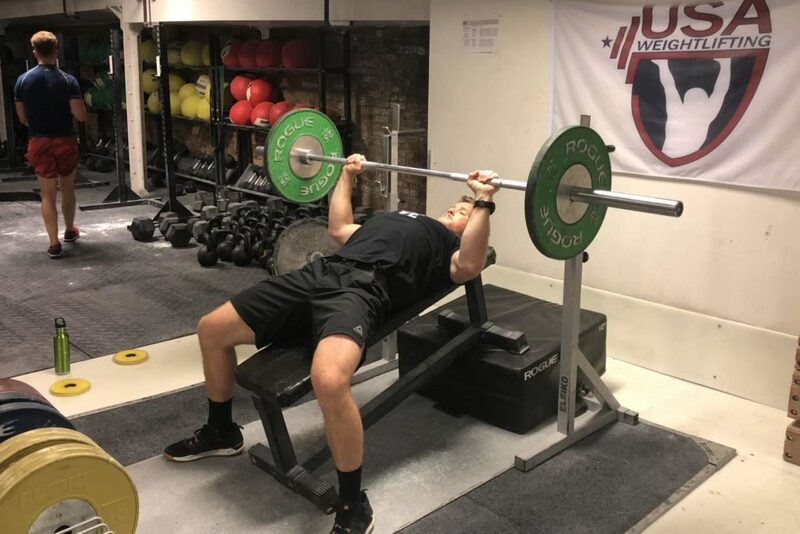 Below are three (3) benefits of the incline bench press that coaches and athletes across all strength, power, and fitness sports can expect when including this lift within strength and accessory programs. 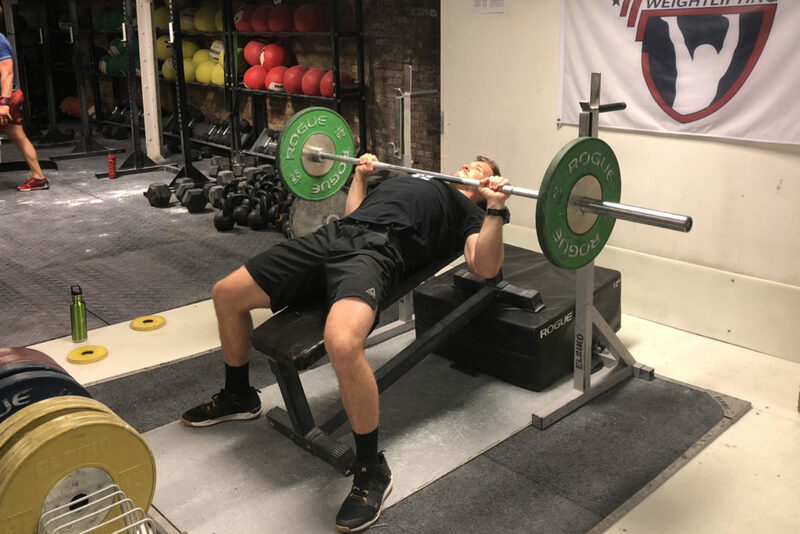 The incline bench press is a movement that has the ability to be trained with heavy loads and high volume, making it a very effective multi-joint, compound lift for developing strength and hypertrophy. Coaches and athletes can use the sets, reps, and weights guidelines below to better individualize strength and hypertrophy programs. The bench press targets the pectoral muscles (chest), regardless of whether the lifter is flat, on a decline, or an incline. The incline bench press, however, can isolate the upper pec fibers to a greater extent due to the increase angle at which the lifter is positioned, making it a good movement to develop weaker ranges and aspects of the chest. Athletes can use the incline bench press to diversify their pressing strength and performance. By switching up the angles of pressing variations, athletes can often target sticking points, address muscle weaknesses, and stimulate new muscle growth. Who Should Do the Incline Bench Press? We discuss why strength, power, and fitness athletes can benefit from the inclusion of the incline bench press within a strength and hypertrophy program. Building overall upper body mass and strength is developed through arduous training, variations of exercise, and addressing all weaknesses. 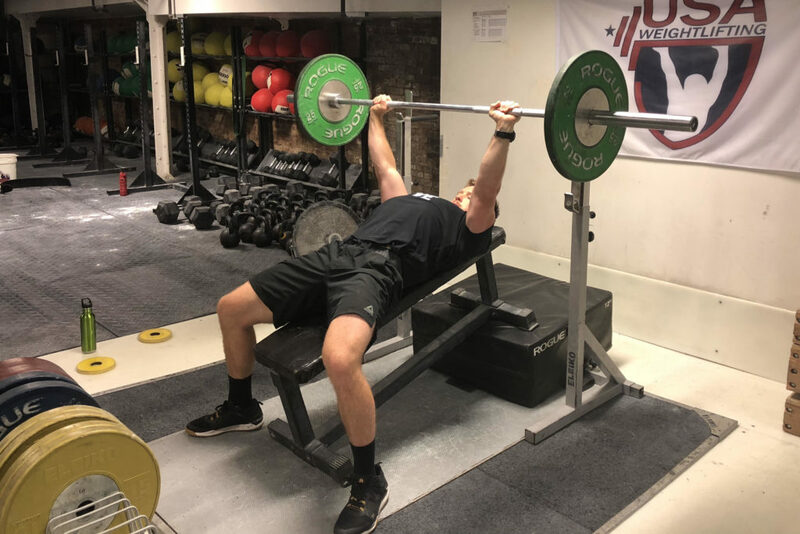 The incline press can be used to bridge the gap between the flat bench press and the overhead press to help lifters train all pressing movements throughout the most common angles seen in sport. In addition, the incline bench press can target the upper pectorals, triceps, and shoulders in a slightly different way to stimulate new muscle hypertrophy and strength gains. Like other pressing movements (overhead press, dips, flat bench press), the incline bench press is another pressing movement that can be used to increase overall upper body pressing strength, muscle mass, and address any weaknesses lifters may have with lack of size or strength in the chest, shoulders, and triceps. In both weightlifting and competitive fitness, the chest, triceps, and shoulders must produce high amounts of force to accelerate loads overhead, stabilize loads overhead, and even produce force during front rack positions and gymnastic movements. In addition, for most competitive fitness athletes, a stronger chest will increase their ability to perform burpees, gymnastic movements (dips, stability on the rings, handstand push ups, etc), overhead lifts, and even bench pressing (such as in the 2018 CrossFit Regionals individual Workout #2, Linda). Increasing upper body strength and muscle mass is helpful for most individuals in most movements of fitness and every day lift. The incline bench press can be used (among others) to increase upper body strength and hypertrophy and progress towards more functional, open-chained, and dynamic movements. Below are four sets, reps, and weight (intensity) recommendations for coaches and athletes to properly program the incline bench press specific to the training goal. Note, that the below guidelines are simply here to offer coach and athletes loose recommendations for programming. Like most exercises, the incline bench press can (and should) be done first with moderate to light loads for controlled repetitions to best acclimate a lifter for the overall loading stress. The incline bench press can be done using both heavy and moderate loads for a mixture of low to moderate volume work sets with moderate rests. The incline bench press can be done in a similar format as most strength lifts, with coaches and athletes using moderate to heavy loads for low to moderate rep ranges with longer rests. The below recommendations can be used as general guidelines for developing greater pressing strength using the incline bench press. The below sets, repetition, loading, and rest period recommendation can be used to increase muscle endurance and/or muscle hypertrophy (due to decreased rest periods and high volume). Below are three (3) incline bench press variations that coaches and athletes can use to replace the standard, incline barbell bench press. The dumbbell incline bench press is very similar to the barbell incline bench press, however does have key benefits to maximize muscle growth and further individualize a program. For some lifters, the placement of the barbell and the positions that the shoulder (angle) is forced into may produce pain or discomfort in the press, limiting the amount of muscle loading and ability to train. By using dumbbells, a lifter can manipulate the angle of the weights, wrist, elbows, and shoulder joint to accommodate any issues/pain/or shoulder flare-ups. Additionally, the dumbbell incline press is a unilateral exercise, meaning it can be done to address movement asymmetrie and muscle imbalances that may be negatively impacting shoulder health, chest development, and/or pressing performance. Like the double dumbbell incline bench press, the single dumbbell variation can increase the lifters need to support and stabilize a load in unilaterally. By using a single dumbbell, the lifter must control and resist spinal rotations and other rotational forces to the body. In addition, some lifters find that they can truly focus on contracting the muscle as hard as possible, when training single-hand pressing. Tempo repetitions can increase time under tension, enhance motor recruitment, and force lifters to slow down to better load the muscles and save the joints. Common flaws seen with the incline bench press are (1) lifters too often drop the weight on the body, (2) lifters bounce it off the chest, and (3) lifters are in no way concerned with the position of the shoulder and elbows in the bottom of the press (which can result in injury to the shoulder or discomfort). By forcing lifters to maintain a strict tempo, you increase their ability to control the movement, load the muscle, and maximize muscle growth without using heavy loads. Below are three (3) incline bench press alternatives that coaches and athletes can use to replace the incline pressing movement yet still target many of the same muscle groups. The flat bench press is often the most popular movement for the upper body and chest in most gyms. This exercise is highly effective at targeting the chest, triceps, and shoulders (primarily the chest). Most powerlifting and strength programs will include the flat bench press in some capacity. While this exercise targets the shoulders, it can be manipulated some to increase the upper pectoral (chest) and triceps development. Increasing the vertical angle of the spine in the press (when going from flat bench to incline bench press to seated shoulder press) shifts emphasis to the shoulders and less off the upper pectorals. With that said, this exercise can be a way to diversify pressing strength to increase strength in all forms of pressing. The incline close grip dumbbell bench press is similar to the above dumbbell pressing options in the variation section, however does slightly change the incline press into a chest and triceps dependent movement. By having a lifter press the pair of dumbbells together with the wrists in a neutral position (facing one another), the lifter can keep the elbows closer into the body, limiting the amount of shoulder stress. This can be done to increase upper pectoral and triceps muscle hypertrophy and pressing strength.